Not too long ago, it was announced that Sony’s PS3 will be receiving Netflix streaming without the need for disc support and it now seems, as of today, that Nintendo’s Wii will be receiving the same service too via the Wii Shop Channel. 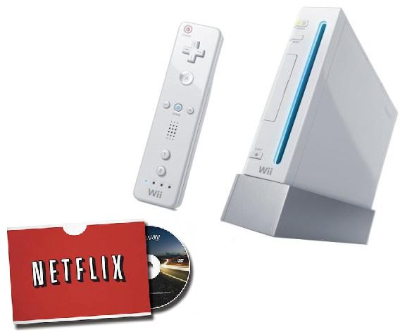 Obviously, this new service to the Wii won’t be coming free but will allow those already subscribed to Netflix to stream content from their massive library of films. For those who aren’t subscribed to the service, they can do so via the Netflix website. It’s fairly straight forward and as long as you’re willing to fork out at least $8.99 a month then you can enjoy this latest avenue of entertainment. To add this service to your other Wii channels, all you have to do is download the app from the Wii Shop Channel at no extra cost. I swear they had this feature- I at the very least remember watching in on my friend’s machine who had a wii. Maybe it was a different set up already, and a lot of my friends are very good with custom hacks and such.